1. We recommend using Adobe PHOTOSHOP and submitting your design as a 100 dpi cmyk TIF file with LZW (lossless) compression. We also support Adobe ILLUSTRATOR files. Formats we accept: LZW TIFF (recommend), JPEG, PSD (CS6 or lower), AI (CS6 or lower). Please contact us if you want to submit a different file format. 2. Design at FULL SIZE using the panel dimensions in our Eclipse templates available for download below. Create a single design for all your panels together (not individually), unless you are trying to have a color change at a panel seam (i.e. the adjacent panels are different colors and the color break is at the panel seam). 3. Design in CMYK. Do not use spot or Pantone colors. We do not provide color matching. Our printed CMYK colors should closely match your designed colors, but exact matching is not guaranteed. Our printed colors are generally about 95% accurate. If you are concerned about color, you can order a printed proof, which is additional. The printed proof we send you will show how our CMYK printer will print your design. We print files as is and do not provide color adjusting or matching services. However, after you receive your printed proof, you are welcome to adjust your design cmyk values based on the printed proof and order a new printed proof. 4. Photoshop files should be set up at 100dpi (at full size). 5. We recommend that placed images be 75dpi if possible. Image resolutions over 100dpi are unnecessary. Avoid using low resolution images. Read more about low resolution images and pixelation problems here. You are responsible for deciding if your image quality (resolution, compression, focus, etc) are ok for your requirements. We can provide input if any of your images seem low-resolution and/or pixelated, but you must decide if they are sufficient for your expectations and requirements. 6. Avoid placing small text or critical information on the panel seams. Try not to have the panel seams (breaks) run through letters or logos if at all possible. 7. Remove unnecessary or hidden layers. Provide only what is to be printed. * File should be saved as a TIFF in CMYK with LZW compression and ICC profiles checked on with no extra Alpha channels. * To help get a smoother gradient without banding, add noise (from 1 to 3). * All fonts should be converted to outlines (Type > Create Outlines). * All raster images should be embedded and not linked. * If any filters or special effects are applied (e.g., blurs or gradient mesh) the file must be rasterized in Photoshop and saved as a TIFF for final artwork submission. * To help get a smoother gradient without banding, the gradient should be created in Photoshop with noise added (from 1 to 3), saved as a TIFF, then brought back to Illustrator and combined with the rest of the artwork. 1) When you place your online order, you will be asked when and how you are sending us your design files. You will be able to request an FTP account so you can upload your design to our server, or you can use a transfer service such as sendthisfile.com or you can provide us a link where we can retrieve your design. 2) After we have received your order and your design, we will check your design* and let you know if there appear to be any issues. If there no issues, we will prepare your design for printing and will then email you a digital eProof to review and approve. Your should receive your eProof within 1 to 2 business days. 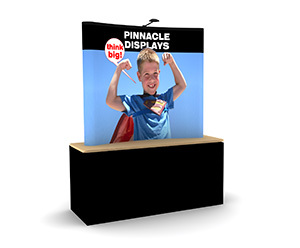 3) After you approve the digital eProof, we will produce your graphic panels. Production takes 5 business days. We will then ship your order via the method you selected on your order. Please allow appropriate time for review, production, and shipping. 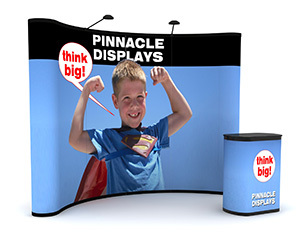 Redefining portable trade show displays.